We describe a framework for the automatic synthesis of biped locomotion controllers that adapt to uneven terrain at run-time. The framework consists of two components: a per-footstep end-effector path planner and a per-timestep generalized-force solver. At the start of each footstep, the planner performs short-term planning in the space of end-effector trajectories. These trajectories adapt to the interactive task goals and the features of the surrounding uneven terrain at run-time. We solve for the parameters of the planner for different tasks in offline optimizations. 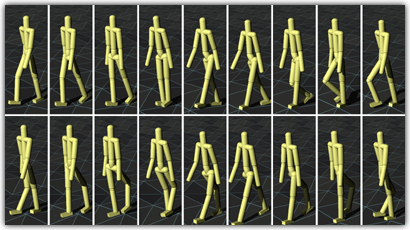 Using the per-footstep plan, the generalized-force solver takes ground contacts into consideration and solves a quadratic program at each simulation timestep to obtain joint torques that drive the biped. We demonstrate the capabilities of the controllers in navigation tasks where they perform gradual or sharp turns and transition between moving forwards, backwards, and sideways on uneven terrain according to the interactive task goals. We also show that the resulting controllers are capable of handling morphology changes to the character. Figure 2. Transition from forward to sideways walk. Figure 3. Transition from forward to backward walk. Figure 4. Climbing upstairs. Rise heights [0, 0.4] m.
Figure 5. Applying the unaltered forward controller to two different bipeds: one with its left knee frozen (top), and one with inverted knees (bottom). © Copyright 2010 by ACM, Inc.